Rina's Rainbow: Kinder Joy Back-To-School Activities with Fully Booked! 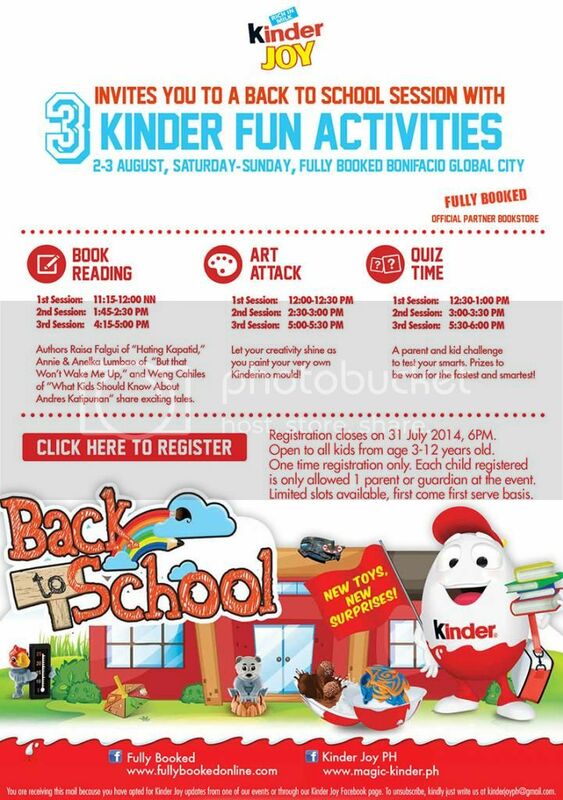 Kinder Joy Back-To-School Activities with Fully Booked! I'm sure moms of toddlers and up out there are familiar with Kinder Eggs. I first tried a kinder egg at the airport of Hong Kong last 2008 when Richie and I were on our way back to Manila from our honeymoon (Yiiiheeeee!). The second time I saw it was three years after on YouTube. My little Rainbow was happily browsing videos and she came across those egg surprise reviews. Ever since then, Rain would spot a white and orange Kinder egg from thousands of grocery shelves away haha! But anyway I have cool news for you guys! Kinder Joy is inviting you and your kids to a back-to school session with three fun activities that your kids will enjoy for sure!!! Check out the schedule below! And remember, SLOTS ARE LIMITED and last day of registration is JULY 31!!! Click the Register Button on the poster above to register or you may also click here! Registration closes on July 31, 2014, 6 PM. Open to all kids from 3 – 12 years old. Each child registered is only allowed 1 parent or guardian at the event. Limited slots available, first come first serve basis.